For many tourists, flights are booked with one thing in mind: cost. If the price is right, travelers are quick to schedule flights with one or multiple layovers, rather than paying for the more expensive direct flight. The following 5 European airports are proclaimed to be the worst places for flight connections in the continent due to lengthy transfer processes, chaotic terminals, and poor accommodations. The higher price for that direct flight may be worth it if it means avoiding flight connections in one of these airports. The first airport to avoid is Heathrow Airport in London. As Heathrow is the busiest airport in Europe, and soon to be even busier with the Olympic Games this summer, maneuvering through the crowds to catch a connecting flight can be extremely inconvenient. The airport’s size along with its confusing security procedures make gate hopping a very difficult and time-consuming process, with some gate-to-gate connections taking 2 hours or longer. In addition to being time-consuming, Heathrow can be very hard on your wallet—a bagel and orange juice breakfast costs about $15! If you have no choice but to connect at Heathrow, allow yourself at least two hours, especially if you have to transfer between terminals. Bringing a snack in your carry-on to avoid those hefty food prices would not be a bad idea either! 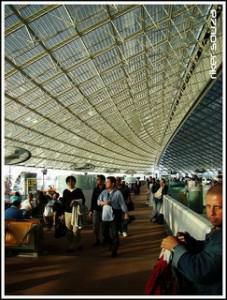 The next airport to avoid is the Charles de Gaulle Airport in Paris. CDG’s irrational processes and procedures make it seem as if they are purposely wasting your time. Instead of using jet bridges (the long tunnels that are normally used to connect the gate to the plane), passengers are transported from their aircraft to the terminal by bus upon arrival at CDG. After passing through immigration and potentially walking one to two miles to the next terminal, passengers take another bus from the gate to the departing aircraft. This lengthy process proves to be very annoying and counterproductive because in many cases, passengers’ departing aircraft ends up being located right next to where their arrival flight had pulled in hours before. People are forced to spend over two hours in gate-to-gate travel through the airport only to end up in the exact same place. If you have no choice but to transfer flights at Charles de Gaulle, we recommend that you give yourself plenty of time and wear comfortable shoes, as you are guaranteed to do a lot of unnecessary walking. The next airport on our list is Barajas Airport in Madrid. When on a connecting flight in Madrid using Iberia Airlines or another One World airline, odds are that you will arrive in terminal 4, which Barajas Airport proudly boasts as being one of the biggest terminals in the world. In this case, however, bigger does not mean better. It is very easy to get lost in the confusingly large terminal while looking for your gate. Another common complaint of Barajas’ Terminal 4 is its lengthy and unreliable baggage claims process. If you must have a layover at the Barajas Airport, it is important to allow yourself plenty of time (at least 2 hours), especially if you’re transferring from one terminal to another (you may want to give yourself 3 hours in this case). Malpensa Airport in Milan is the fourth airport to avoid when choosing a connecting flight. Common complaints about this airport address the overcrowded and dirty terminals and unfriendly staff. Many customer report restroom problems such as overflowed and unusable toilets and even unusable restrooms in general. Another regular complaint is the limited restaurant and food options. Even if you are able to find something that seems appetizing, the food is overpriced. So, if you absolutely have to connect flights at Malpensa, we would recommend packing a snack of some sort and avoiding the bathrooms. If you can hold it until you get onto your departing aircraft, you may even find the on-board bathroom to be cleaner and more comfortable. The fifth and final airport on our list to avoid is the Sheremetyevo Airport in Moscow. As a hub for Aeroflot, Sheremetyevo is a common flight connection location for US tourists visiting Eastern Europe and the Middle East (and has recently experienced a significant increase in air traffic). The most frequent complaints about this airport are confusing signs, unhelpful staff, and a terribly inconvenient building layout.Transferring between terminals is extremely stressful, as you need to pass through Russian Immigrations, which requires a transit visa for citizens of most other countries and has very long lines. Obviously, we cannot always find the perfect flight. Sometimes we have to give in to the cheaper airfare and suffer through these less than conducive airports during a layover. If you cannot avoid transferring flights in one of these five cities, at least you now know how to prepare for what might be a stressful and lengthy layover process. Give yourself plenty of time for transfers, be ready to figure out the system without the help of friendly staff and be prepared to do a lot of walking. Also, save yourself some money and bring a snack in order to avoid the pricey food options. Most importantly, do not let a poor airport experience ruin your trip. Plan as best as you can, but prepare to be flexible when you inevitably encounter some of these unpredictable speed bumps. Derek Giannetti, a guest contributor to the Healthy Travel blog, is an upcoming senior at Ursinus College where he plays football and studies exercise and sports science. Upon graduation, Derek hopes to pursue a career in health and physical education.